BACKGROUND: Breast cancer (BC) is the most common type of cancer among women in the world. Patients can face musculoskeletal disorders due to treatment side effects that result in failure to walk, falling, or fractures associated with balance problems. PURPOSE: The aim of this study was to determine whether postural balance would be affected during chemotherapy (CT) in people with BC. MATERİALS AND METHODS: A total of 32 women who consulted the medical oncology department, between 31 and 63 years of age, were admitted to the study. For fear of falling, fall efficiacy scale; for static balance, double-leg, single-leg, and tandem stance tests with eyes opened and eyes closed; Romberg test; for dinamic balance, Sit To Stand (STS) test, and Time Up and Go (TUG) tests were performed in the patients. RESULTS: Reduced fear of falling between CT cycles (P < 0.0125), no change in postural sway in double-leg stance test with eyes opened (P = 0.734) and eyes closed (P = 0.127), significantly increased postural instability in single-leg and tandem stance test with eyes opened and eyes closed (P = 0.000), no change in postural stability in Romberg test (P > 0.05), significantly increased postural instability in STS (P = 0.000) and TUG tests (P = 0.000), and significantly increased time of finishing the STS (P = 0.021) and TUG tests (P = 0.010) were noted. CONCLUSİON: Patients demonstrated postural instability which can ruin the daily life activities in many parameters of measurements. Postural balance exercises should be performed by BC survivors undergoing CT. Breast cancer (BC) is the most common type of cancer among women in both developed and developing countries, with slightly higher incidences in the latter., Chemotherapy (CT) is the cornerstone of BC treatment and has numerous toxicity-related side effects. Furthermore, patients with BC may suffer from musculosceletal problems, which can disturb their postural balance control. It is known that balance problems and falls occur especially within the first 2 years after CT., Patients with unilateral lymphedema have even greater balance problems compared with the healthy control group. When the side effects and the toxicities of the CT are considered, it is important to evaluate the balance functions and take precautions in daily life. The objectives of this study were to (1) identify whether postural balance was changing during the CT process and (2) prove the necessity of postural balance exercises in patients with BC receiving CT. Patients with stage I–IIIA BC who were receiving CT were recruited in this prospective study. The eligibility criteria included diagnosis of nonmetastatic BC, age under 65 years (to avoid interference by the effects of aging), no history of prior CT, and Mini Mental test score ≥23 (for adequate cognitive performance). Patients were excluded if they had a problem with verbal or visual communication, had neurologic or orthopedic disorders, had high-level lymphedema, and wore external prostheses. Patients who met the inclusion criteria were enrolled after examination by a medical oncologist. Patients who agreed to participate in the study filled an informed consent form. The tests were performed by the same investigator, hence, the patients received the same instructions prior to each test. CT sessions of BC are generally organized every 3 weeks, and therefore, the tests were performed every 3 weeks and prior to CT to avoid its acute effects. The tests were performed for four cycles of CT, which often ends after four to six cycles. MOX is an activity monitor accelerometer used to digitally measure the postural sway intensity. It can also be used to measure the physical activity level and postural sway changes in daily life and monitorize the data. Every measure is reported both graphically and numerically (number of activities per se cond). The accelerometer is placed in the lumbosacral area because it is near to the center of gravity. The IDEEQ (Data Acquisition and Analysis Software) was used to analyze the data. This program allows observation of three different graphics: XYZ axis graphics, postural sway intensity graphic, and physical activity graphic. Postural sway intensity graphic was used for this study. The numeric data of postural sway intensity (number of activities per se cond) were exported from the graphical data. The mean of these numeric data was used as postural sway intensity data and recorded to compare each cycle of CT. Demographics and clincal characteristics assessed included weight, height, age, dominant arm, educational status, occupation, menopausal status, BC stage, treatment type, diagnosis, and the affected side. Mini Mental State Examination Test (MMSE) was used for cognitive function. The possibility and clarity of communication while performing the tests were assessed. The MMSE test score ranges from 0 to 30. Higher scores indicate better cognitive function. Romberg test was performed while the patient was standing with her feet together and eyes closed for 10 s. An irregular sway and even toppling were recorded by the MOX accelerometer, and digital data were collected. Fall efficacy test was used to determine the change in the fear of falling in every cycle of CT. It is a self-reported form that has 10 items about daily life activities. In each item, the patient chooses a suitable score from 1 (not absolutely insecure) to 10 (absolutely insecure) points. The score over 70 points means a fear of falling. Balance tests were used to measure both static and dynamic balance. For static balance, the stance tests (single-leg, double-leg, and tandem stance) and for dynamic balance the Sit To Stand (STS) test and Time Up and Go (TUG) test were used. Also, MOX accelerometer was used in all balance tests to store a digital data of the postural sway intensity. 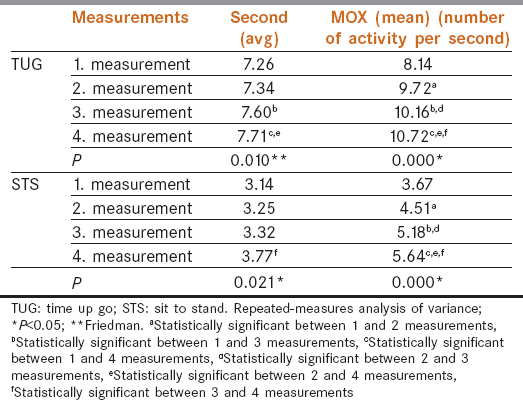 In stance tests, single-leg, double-leg, and tandem stance were performed by MOX accelerometer which recorded 20 s of postural sway for each stance. All the stance tests were measured with eyes opened and closed. An average of 20 s of postural sway intensity was used to compare each cycle of CT. In STS, patients were requested to stand up from a 43-cm-high chair, with their arms crossed over their shoulder, and as fast as they could do. The chronometer was started with the “start” command and stopped when the pelvis touched the chair. This test was performed by the MOX accelerometer to monitorize the postural sway intensity and by recording the time. In TUG test, the patients were requested to stand up from the chair without any hand support, walk 3 m, turn without touching anywhere, and go back to sit as fast as they could. The test was measured by recording the time; meanwhile, the accelerometer was also used to store postural sway intensity. Finishing the test after 10 s indicates a deterioration in daily life activities. The trial was approved by the Ethics Committee of Marmara University, Institute of Health Sciences. (Reference No. 22.09.2014-9). Descriptive data for variables were presented as means and frequences by percent of sample. The Kolmogorov-Smirnov test was used to test compliance with normal distribution. To analyze the change in the balance between CT cycles, repeated-measures analysis of variance was used if it was parametric; Friedman test was used if it was nonparametric. Furthermore, Benforoni (parametric) and Wilcoxon signed rank (nonparametric) tests were used to analyze the change between the binary measurements of CT cycles. SPSS Version 16.0 (SPSS Inc., Chicago, IL, USA) was used for data analysis. Significance level was set at P = 0.05 (95% confidence interval). Thirty-two patients with BC who met the eligibility criteria were enrolled in this study. The mean age was 47.5 (range: 31–63) years, and the mean height was 159 (range: 147–173) cm. The mean MMSE score was 27.7 (range: 24–30). The weights increased significantly between the CT cycles 1–3 and 1–4 (P < 0.05). 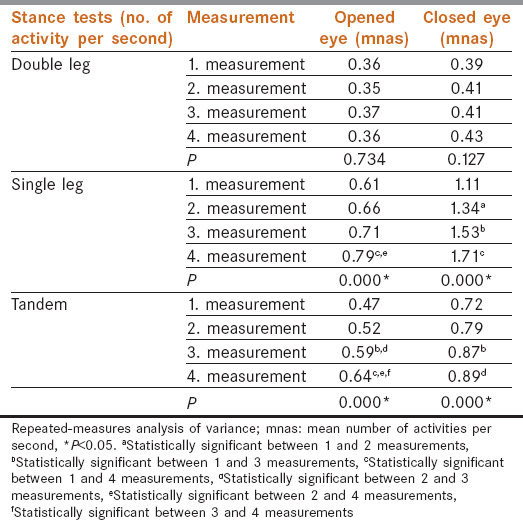 Comparison of stance tests (single-leg, double-leg, and tandem stance) with eyes opened and closed by accelerometer revealed no change in postural sway in double-leg stance both with eyes opened and closed (P > 0.05), but increased postural instability in single-leg and stance tests both with eyes opened and closed (P < 0.05) [Table 1]. There was no significant change on postural sway in Romberg test measured by the accelerometer. Fall efficacy scale surprisingly demonstrated a significantly decreased fear of falling between the CT cycles 1–3, 1–4, and 2–4 (P < 0.05). In TUG and STS accelerometer tests, patients demonstrated significantly increased postural instability between all binary cycles (P < 0.05). When the times of TUG and STS tests were compared, patients were significantly slower between the CT cycles 1–3, 1–4, and 2–4 in the TUG test and between the CT cycles 3–4 in the STS test [Table 2]. To our knowledge, this study is one of the first to demonstrate the acute effects of CT cycles on postural sway in patients with BC. Patients demonstrated worse postural balance performance through the CT cycles in most of the tests. Significant postural changes were observed in single-leg and tandem stance tests with both closed and opened eyes, as well as in TUG and STS tests. These findings provide a novel insight into the understanding of postural instability as one of the adverse effects of CT, which could affect the patient's function and quality of life. The changes observed in postural instability through the CT cycles are concordant with previous studies. Manfort et al. reported gait and balance impairments in patients treated with taxan-based CT., There are other studies that investigated the functional capacity, fear or frequency of falls, and quality of life, along with others that demonstrated indirect effects on postural stability in patients with cancer. Tofthagen et al. demonstrated that patients with cancer who are undergoing CT generally have balance problems because of fatique and neurotoxicity. Holley found that the use of neurotoxic drugs leads to damage of the peripheral and central nervous systems and potentially causes an irregular walking pattern, ataxia, and confusion. In another study, 75 postmastectomy patients were evaluated for postural balance using 30 s eyes opened and closed test, and balance deficits were more common in closed eye test, but there was no change in opened eye test, compared with the control group. An impaired postural stability in all stance tests with both closed and opened eyes except the double-leg stance test was seen in this study. One study which investigated the visual impacts of CT in patients with BC found that the use of aromatase inhibitors could lead to vision loss. In our patient group, there was no use of aromatase inhibitor (tamoxifen). Therefore, it can be presumed there were no visual problems which could have affected balance. On the other hand, a study demonstrated that the falls in BC survivors were associated with the delay in the low contrast of visual impulses. This study evaluated both closed and opened eyes to observe the natural visual effect on postural balance. Another study found that the center of gravity was affected in both closed and opened eye tests in patients with BC compared with the control group. In accordance with our study, there was a significant change in postural stability in single-leg and tandem stance tests with both closed and opened eyes. However, there was no significant change in double-leg stance test. Therefore, it could be speculated that postural stability is getting worse during CT cycles especially by narrowing support surface ground. Romberg test shows the loss of postural control that occurs by the proprioception deficits of lower extremity in the absence of any visual stimulus. It was used because it can be an indicator for postural balance if such a deficit exists. There were no postural changes in Romberg test through the CT cycles in this study. Surprisingly, a decreased fear of falling was noticed among the patients in this study. Conversely, another study showed that patients with cancer have poorer physical performance than healthy people due to increased fear of falling and physical deficits. It could be related to individual psycological conditions of the patients. STS and TUG tests are used commonly for evaluating dynamic balance., These dynamic tests are functional tests widely used to predict the probability of falls and functional statuses of the patients in daily life activities.,, In the current study postural stability was assessed by using accelerometer and timer (recording seconds) at the same time. The postural stability was worse in all parameters of dynamic balance tests among the CT cycles. It should be noted that patients with BC are at risk of falling in daily life activities during CT cycles. The results of this study showed that patients with BC undergoing CT have an increased postural sway and deteriorated postural balance during the CT cycles, supporting previous studies which analyzed the postural balance problems indirectly. The limitations of this study could relate to the medical records. Although unilateral upper extremity lymphedema impairs postural stability, the study lacks a detailed assessment of lymphedema in each cycle of CT. Another limitation is the duration after the breast operation, because early period of postoperation could be painful or sedentary which could affect postural stability. Recruiting participants from a single hospital is another limitation of this study. In conclusion, the postural balance deteriorated, as assessed by many parameters of postural balance measurements, during the CT cycles in patients with BC. In stance tests, especially on the narrower equilibrium surface of the body (single-leg and tandem stance), the postural balance problems were greater between the CT cycles. Dynamic tests also demonstrated a deterioration in postural balance. These results are helpful in guiding patients, clinicians, and health workers. It is important to avoid any falls and lower the fracture risks due to CT in patients with BC. The patients must be informed about postural instability during the CT cycles and should be guided about modifying their daily life activities. Patients with BC receiving CT should be encouraged to perform “postural balance exercises.” Further studies may investigate “the early effects of postural balance exercises” or “the long-term effects of CT on postural stability” in patients with BC. Special thanks to Prof. Dr. Serdar Tuncer, Prof. Dr. Sezer Saǧlam, Assoc. Prof. Dr. Çetin Ordu, and Medical Oncology Department nurses of Florence Nightingale Hospital. This work was supported by the Marmara University, Scientific Research Projects Committee, Award Number: SAG-C-YLP-110315-0055. Mox activity monitor (accelerometer) was provided by the committee. GLOBOCAN. Estimated Cancer Incidence, Mortality and Prevelence Worldwide. WHO International Agency for Research on Cancer; 2012. Available from: http://globocan.iarc.fr/Pages/fact_sheets_cancer.aspx. [Last accessed on 2018 Sep 04]. Coleman MP, Quaresma M, Berrino F, Lutz JM, De Angelis R, Capocaccia R, et al. Cancer survival in five continents: A worldwide population-based study (CONCORD). Lancet Oncol 2008;9:730-56. NCCN Clinical Practice Guidelines in Oncology™. NCCN Guidelines For Supportive Care. Available from: https://www.nccn.org/professionals/physician_gls/default.aspx#supportive. [Last accessed on 2018 Sep 03]. Winters-Stone KM, Nail L, Bennett JA, Schwartz A. Bone health and falls: Fracture risk in breast cancer survivors with chemotherapy-induced amenorrhea. Oncol Nurs Forum 2009;36:3. Pfeilschifter J, Diel IJ. Osteoporosis due to cancer treatment: Pathogenesis and management. J Clin Oncol 2000;18:1570-93. Mincey BA, Duh MS, Thomas SK. Risk of cancer treatment-associated bone loss and fractures among women with breast cancer receiving aromatase inhibitors. Clin Breast Cancer 2006;7:127-32. Melton LJ, Hartmann LC, Achenbach SJ, Atkinson EJ, Therneau TM, Khosla S. Fracture risk in women with breast cancer: A population-based study. J Bone Miner Res 2012;27:1196-205. Balaban Ö, Nacır B, Erdem HR, Karagöz A. Denge Fonksiyonunun Deǧerlendirilmesi (Evaluation of postural balance). FTR Bil Der 2009;12:133-9. Mehmet B. Düşmelerin Nedenleri ve Önlenmesi (Causes and prevention of falls). Available from: http://www.geriatri.org.tr/SempozyumKitap2011/11.pdf. [Last accessed on 2018 Sep 03]. Hile ES, Fitzgerald GK, Studenski SA. Persistent mobility disability after neurotoxic chemotherapy. Phys Ther 2010;90:1649-57. Winters-Stone KM, Torgrimson B, Horak F, Eisner A, Nail L, Leo MC,et al. Identifying factors associated with falls in post menopausal breast cancer survivors: A multi disciplinary approach. Arch Phys Med Rehabil 2011;92:646-52. Angin S, Karadibak D, Yavuzşen T, Demirbüken İ. Unilateral upper extremity lymphedema deteriorates the postural stability in breast cancer survivors. Contemp Oncol (Pozn) 2014;18:279-84. Van der Weegen S, Essers H, Spreeuwenberg M, Verwey R, Tange H, de Witte L, et al. Concurrent validity of the MOX activity monitor compared to the ActiGraph GT3X. Telemed J E Health 2015;21:259-66. Folstein MF, Folstein SE, McHugh PR. “Mini-mental state.” A practical method for grading the cognitivestate of patients for the clinician. J Psychiatr Res 1975;12:189-98. Tinetti ME., Inouye SK, Gill TM, Doucette JT. Shared risk factors for falls, incontinence and functional dependence: Unifying the approach to geriatric syndromes. J Am Med Assoc 1995;273:1348-53. Susco TM, McLeod TCV, Gansneder BM, Shultz SJ. Balance recovers within 20 minutes after exertion as measured by the balance error scoring system. J Athl Train 2004;39:241-6. Segura-Ortí E, Martínez-Olmos FJ. Test-retest reliability and minimal detectable change scores for sit-to-stand-to-sit tests, the six-minute walk test, the one-leg heel-rise test, and handgrip strength in people undergoing hemodialysis. Phys The 2011;91:1244-52. Monfort SM, Pan X, Patrick R, Ramaswamy B, Wesolowski R, Naughton MJ,et al. Gait, balance, and patient-reported outcomes during taxane-based chemotherapy in early-stage breast cancer patients. Breast Cancer Res Treat 2017;1-9. Monfort SM, Pan X, Patrick R, Singaravelu J, Loprinzi CL, Lustberg MB,et al. Natural history of postural instability in breast cancer patients treated with taxane-based chemotherapy: A pilot study. Gait Posture 2016;48:237-42. Huang MH, Lytle T, Miller KA, Smith K, Fredrickson K. History of falls, balance performance, and quality of life in older cancer survivors. Gait Posture 2014;40:451-6. Tofthagen C, Overcash J, Kip K. Falls in persons with chemotherapy-induced peripheral neuropathy. Support Care Cancer 2012;20:583-9. Holley S. A look at the problem of falls among people with cancer. Clin J Oncol Nurs 2002;6. Rachwał M, Drzał-Grabiec J, Walicka-Cupryś K, Truszczyńska A. Control of static balance among women after mastectomy. Vision impact on the quality of the equilibrium response. Adv Rehabil 2013;27:9-16. Eisner A, Luoh SW. Breast cancer medications and vision: Effects of treatments for early-stage disease. Curr Eye Res 2011;36:867-85. Montezuma T, Oliveira Guirro EC, Oliveira Lima Leite Vaz MM, Vernal S. Changes in postural control in mastectomized women. J Cancer Ther 2014;5:493-9. Lanska DJ, Goetz CG. Romberg's sign: Development, adoption, and adaptation in the 19th century. Neurology 2000;55:1201-6. Niederer D, Schmidt K, Vogt L, Egen J, Klingler J, Hübscher M, et al. Functional capacity and fear of falling in cancer patients undergoing chemotherapy. Gait Posture 2014;39:865-9. Shumway-Cook A, Brauer S, Woollacott M. Predicting the probability for falls in community-dwelling older adults using the Timed Up & Go Test. Phys Ther 2000;80:896-903. Ozalevli S, Ozden A, Itil O, Akkoclu A. Comparison of the Sit-to-Stand Test with 6 min walk test in patients with chronic obstructive pulmonary disease. Respir Med 2007;101:286-93. Podsiadlo D, Richardson S. The time “up and go”; a test of basic functional mobility for frail elderly persons. J Am Geriatr Soc 1991;39:142-8.